+ .50 for tomato & lettuce. Isn't that usually just part of the deal? As my late grandmother who grew up on a farm not too far from Huntington might have said, Nick's appears to be getting too big for its britches. stevez wrote: + .50 for tomato & lettuce. Isn't that usually just part of the deal? It's right there printed on the menu. I suppose you would feel better if they just listed them like restaurants list hamburgers at different prices with the different condiments? I've never seen a plain hamburger the same price as a California burger. C'mon guys, you're acting cheeky with the pile on. The deal is many people don't like anything on their tenderloins. Hoosiers have this thing about the Holy Grail of pickle, mustard and onion as standard. 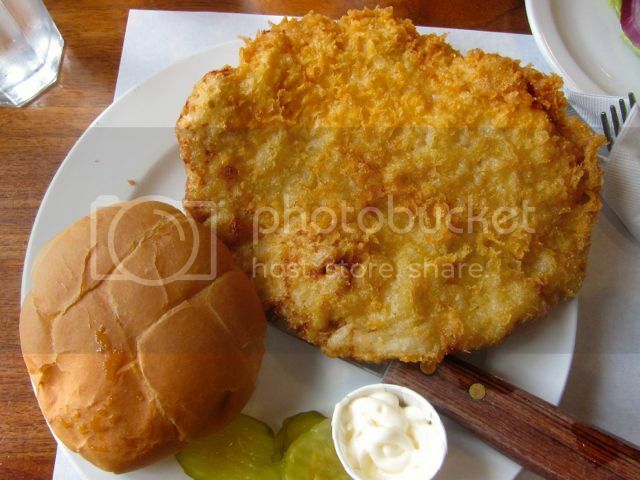 For some reason many Hoosiers dislike the idea of cheese on a tenderloin which is popular in other states. Every area has its preferences. Chicago is Bohemian style with gravy and soggy white bread buried underneath. Outstate Illinois loves them huge and they rarely get bigger than Smitty's in Leonore. Iowans have their super flattened crispy favorites. Up here in Minnesota many restaurants serve them with toast instead of a bun, and with cheese. The farther away from the Midwest they are usually much smaller and don't hang over the bun much at all. In fact, the farther you get from the Midwest the higher the odds you'll get served true pork tenderloin than pork loin. Nick's Kitchen makes a fresh tenderloin. They stay open until 2 PM. Afterwards they take hand pounded tenderloins and marinate them in buttermilk overnight and bread them the next day before frying. There are few restaurants that take those steps. I'm not arguing you can get a bad one as I have mentioned from experience there are so many variables in frying them that can affect what you get. Usually it is how busy they are or who is the cook at the fry station. Sometimes it can just be the batch of meat prepared. That Ale Emporium tenderloin previously shown looks good. It looked much better than the one I had there which also happened to be one of the disappointing ones I had in Indianapolis though they have a good reputation. 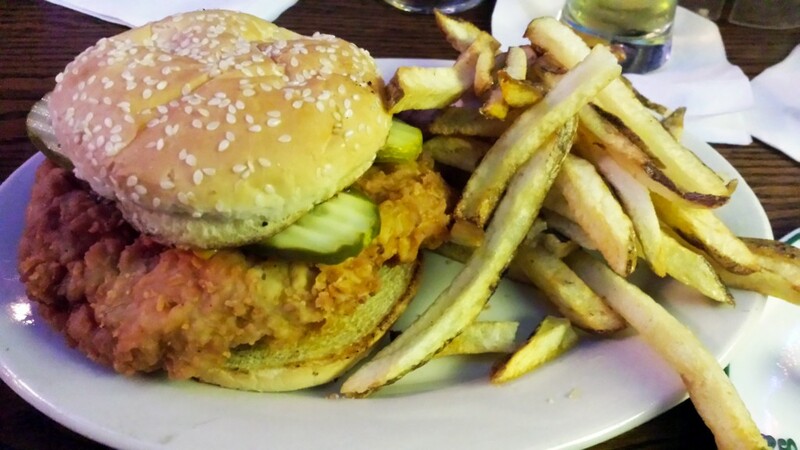 Yes, Nick's Kitchen is the oldest restaurant breaded tenderloin sandwich dating back to 1908 that has any verifiable documentation and that restaurant has been in continuous business in that location. 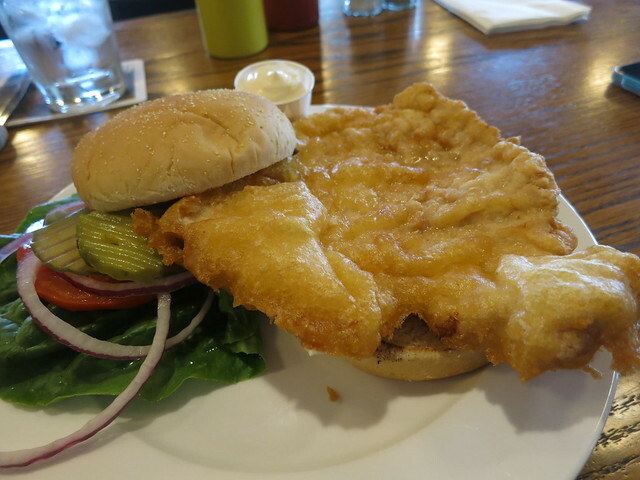 A tenderloin is nothing but a pork Schnitzel on a bun. Could there have been older? Yes, but not from any other restaurant and the whole idea of a sandwich did not become popular until around the turn of the last century. Nick's started out at as a street cart in 1904 so the bun and holding in the hand probably sprung from that. Restaurants were mostly plate meals back then. 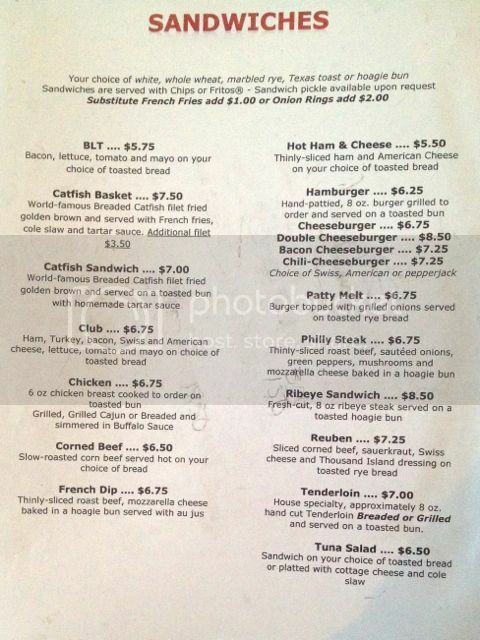 From my research no one has come up with a menu or tenderloin sandwich description older than Nick's Kitchen. I'm old enough to know and remember the 1950s well enough to know that the breaded pork tenderloin sandwich is actually much more popular and pervasive today than back then. Rene G wrote: Plump's Last Shot is one of the few sports bars I find tolerable, and only partly because they serve good food. I found this sandwich admirable in almost every way (though admittedly it verges on overly large). 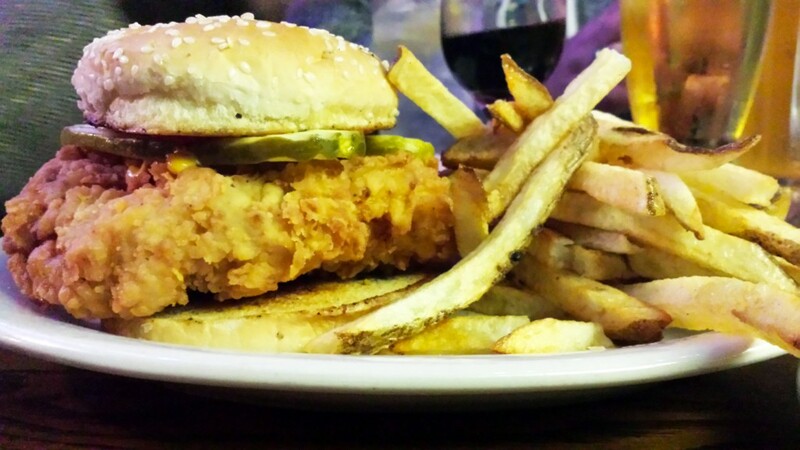 Where I grew up in Quincy, IL, nearly every tavern serves a pretty respectable tenderloin sandwich and based on my experiences, "verges on overly large" may be a pretty good starting point for a definition of a good tenderloin sandwich. Or at least has been common to the best ones I've had. I had a better than average tenderloin last week in Indianapolis at the Taylor's Pub outlet in Nora (86th and Westfield Boulevard). This is a fairly generic suburban sports bar setting, but the kitchen was a notch above where it might need to have been. The pork tenderloin was actual pounded fresh meat and had some good, real pork flavor and texture to it. Not an oversized "show" tenderloin; it was sized to fit the bun. To dress it, I requested the Hoosier Holy Trinity (onion, pickle, mustard), and it came with a nice, big slice of red onion and a plethora of pickle slices (mustard was on the table to add as I saw fit). Served with a peculiar side dish of tiny pretzel twists in a sort of salty pesto glaze; I'd ask for fries next time. I was thinking about BPTs all last week, and luckily for me, I happened to be visiting my hometown of Quincy, IL last weekend for the lovely SaintPizza's high school class reunion. Friday night, she and I split one of the beasts along with an order of cheeseballs (breaded, fried cubes of cheddar) and a pitcher of to-remain-unnamed fizzy yellow liquid at a little place down the block from my best friend's house called State Street Bar & Grill. (He had a burger, which I was informed was quite good). I told the waitress we'd be splitting the tenderloin sandwich and that must be a common order, as the kitchen cut it in half and it was served on 2 different plates, each with its own bun. Each half-tenderloin nearly filled its plate. It's likely that many of the tavern-style places in Quincy get their tenderloins & much else on their menus from Kohl Wholesale, a food service business with a warehouse and a retail "cash & carry" storefront just off the Quincy riverfront. So this tenderloin may have come frozen & pre-breaded in a box. But the Kohl tenderloins in my experience are done right, pounded nice and flat and big, not overly-seasoned but breaded with cracker crumbs the way a tenderloin should be. State Street did a good job of cooking it so it was golden brown and still juicy on the inside. I ate mine and half of hers and both of us left pretty much stuffed. While I was in town, I also picked up a case of the Kohl frozen tenderloins, so I don't have to wait for my next trip back home to have another. Growing up in Chicago I have no ties to the tenderloin. I'm by no means a purist when it comes to how a place should serve one and from what I've gathered through Tyrgyzistan's unmatched Iowa 'loin round-up is that there's no exact law as far as breading/size etc in Tenderloinland anyway. So take these rec's for what they're worth but I think I tasted my top two tenderloins to date just recently. The first one came from a well known spot in Des Moines as posted by jimswside HERE. I got the regular breaded pork tenderloin and he tried the turkey version. The latter came out lightly breaded, juicy and well spiced. It was a great simple sandwich and much better than the regular one. Then a day later I had an even better not so normal tenderloin from this place. 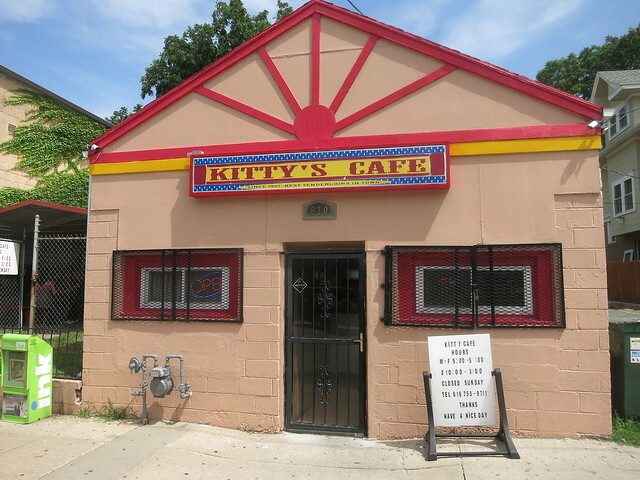 Kitty's Cafe in Kansas City - "Since 1951 - Best Tenderloins in Town"
I think that review was from about five years ago and as you can see it's still the same five years later and that should be no surprise. They were doing steady business on our visit so I placed the order and read a few of the articles on the wall while I waited. It isn't owned by the same family anymore but most everything remains the same. Sure the menu prices have changed but even now they're still a bargain. Nothing is over $6. I decided to ball out and get the most expensive thing on it. 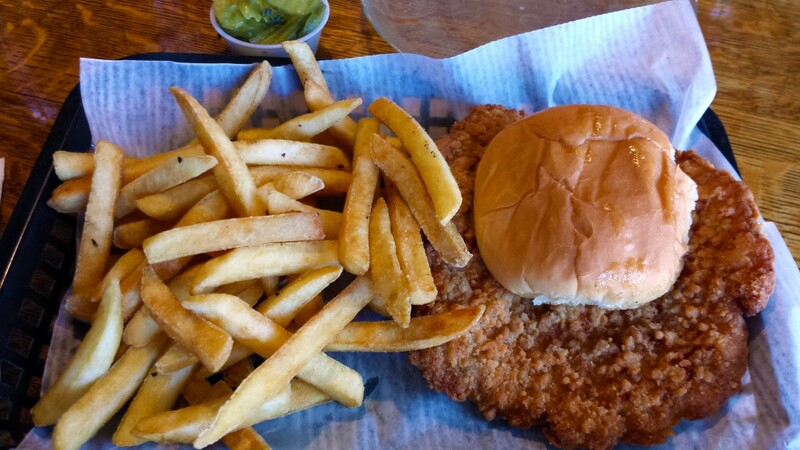 As you can see, this aint your Indiana grandma's tenderloin. The original owners added their own cultures touches and served them with a tempura batter as well as hot sauce. Everything includes lettuce, tomatoes, and pickles too. The patties are small but they stack a few on top of each other and the meat is thinly pounded but you're still able to taste it due to the light yet extra crunchy breading. One of the better bites in a big weekend of chowing. As always, more to come. My ventures in tenderloin pursuits took me to several places this year so far in seven different states but one tenderloin stood out. 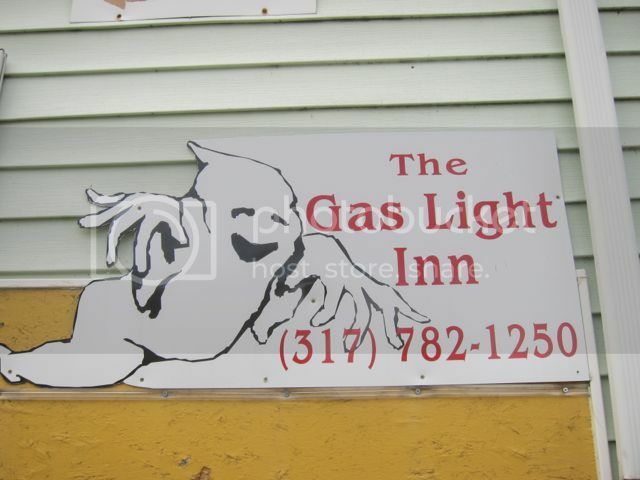 It was the Gas Light Inn. The name belies what it really is and that is a neighborhood over 21 bar in the vein of the Workingman’s Friend and John’s Famous Stew in Indianapolis. It is on South Meridian Steet about 2 miles south of downtown. I went solely for the tenderloin and can say their tenderloin is right up there with the very best in Indianapolis. It is my kind of place. Nothing fancy. Just a good comfortable place. They made a big deal about a ghost but I pretty much ignored that hype. The building was rather bland and shabby and not Victorian or haunted looking to support such lore. After dinner, settling up and talking to the cook, I was late getting out to the parking lot in back. The rest of our party was there and the locals were yelling Kenny did it. Did what? Hit my friends car and drove off. So standing around in the parking lot we had to assure the damage was not done by Kenny. Of course everyone had had a few so when in a crowd talking ensued. As it turned out we talked about high school football during the late 50s. One guy knew my older brother and we started exchanging stories of that period and who we mutually knew. It was not quite my old neighborhood where I grew up but adjacent. 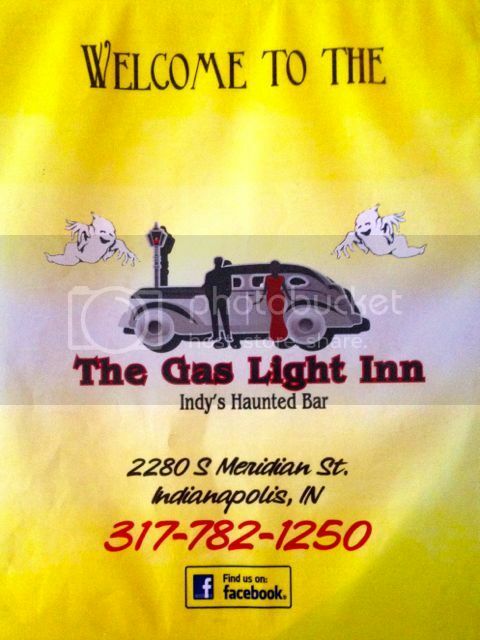 Until recently I had never heard of the Gas Light Inn but I am glad I went there. I haven’t been on here much lately but since I now spend about 75% of my time in Kansas City, I thought I’d add a couple of nice tenderloin places I’ve found. 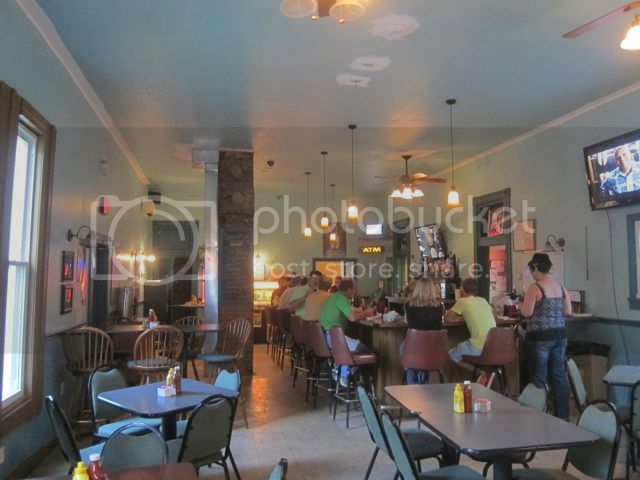 The first, Big Bam’s Burgers, is known locally for its fresh ground hamburgers and its short list of gourmet burgers. I’ve had one and it was good and my college age son loves the En Fuego burger; fried jalapenos, cream cheese and cancun dressing. But they also have a fresh hand cut tenderloin; it comes with pickles, onions and mayo. I always replace the mayo with mustard. Like most local places in KC, they have tator tots and this is what I get for a side. Overall this is a nice pork tenderloin. The second place serves slightly better BPT. The breading is a little thicker (but not too much) and it is a little larger than Bam’s. Again Grandstand is known locally for a burger, its Kelly Burger is a large cheeseburger with pastrami on it. Their BPT comes with lettuce, tomato and mayo again I drop the may for mustard. I like their tator tots better than Bam’s. I like Grandstand’s BPT a little better than Bam’s, bigger, better breading and cooked a little longer (browner). It is basically a takeout place, there are only a couple of stools inside and a few picnic tables outside. 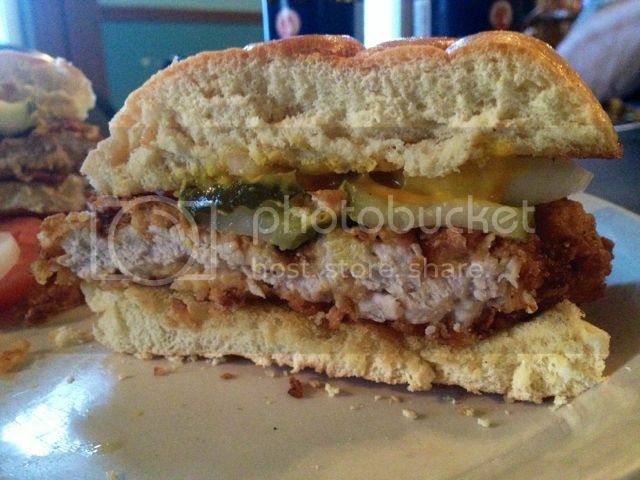 Next on my list of places to try is Christy’s Tasty Queen in Kansas City, Kansas. I’ll try to remember pictures. I will be in KC on Saturday night. I do appreciate your additions to this list. wesuilmo wrote: The second place serves slightly better BPT. The breading is a little thicker (but not too much) and it is a little larger than Bam’s. Again Grandstand is known locally for a burger, its Kelly Burger is a large cheeseburger with pastrami on it. Their BPT comes with lettuce, tomato and mayo again I drop the may for mustard. I like their tator tots better than Bam’s. I like Grandstand’s BPT a little better than Bam’s, bigger, better breading and cooked a little longer (browner). It is basically a takeout place, there are only a couple of stools inside and a few picnic tables outside. Good call on GrandStand and their tenderloin—one of the better ones I've had recently. Nice thickness, excellent breading, well browned (as you noted). Also tried a Kelly Burger (no pastrami but bacon on top and ham underneath) with tots 'n' rings. 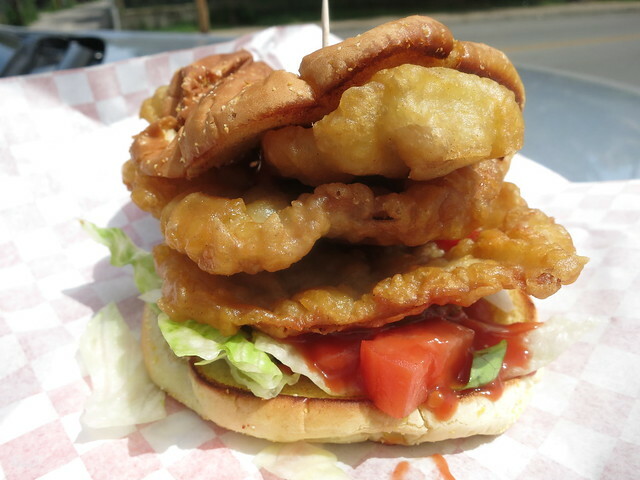 I decided to put a separate post about GrandStand's burgers over in the Kansas City: Burgers thread, where it's already been discussed a bit. Good place. I had another BPT while I was in Quincy over Labor Day weekend. 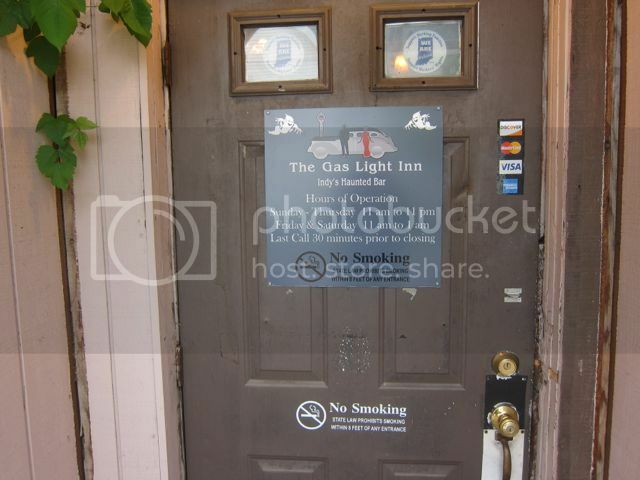 We stopped by the Grove Inn out on Broadway past the interstate and the big box stores. It was of the thicker variety & the breading was more of a seasoned breadcrumb type than the cracker crumb type I prefer on a tenderloin. Also the pork was a little stronger flavored than what I expect. It wasn't bad at all, just not exactly what I was looking for. I didn't like it as well as the tenderloin at State Street Bar & Grill but it's apparently pretty well thought of down there. It looked nice enough though. I arrived at O'Hare from about 17 hours of travel and a friend picked me up at the airport. I had offered her dinner in exchange for the ride and she picked L Woods. Their Wednesday special is a breaded pork tenderloin which she ordered. I tasted hers and was amazed at how good it was, moist tender meat pounded thin with a cracker breading, served with a really good chunky applesauce. There's no bun, but it comes with mashed potatoes for which she subbed out a baked, I was actually sorry I'd gone for the burger and not the special. I believe its only offered on Wednesdays, but I plan to return and make sure this wasn't a fluke. mbh wrote: I tasted hers and was amazed at how good it was, moist tender meat pounded thin with a cracker breading, served with a really good chunky applesauce. L. Woods does do their fried items very well. The Sunday special of Fried Chicken is equally good, and when they have fried clams as an appetizer special, don't miss ordering them. mbh wrote: I arrived at O'Hare from about 17 hours of travel and a friend picked me up at the airport. I had offered her dinner in exchange for the ride and she picked L Woods. Their Wednesday special is a breaded pork tenderloin which she ordered. I tasted hers and was amazed at how good it was, moist tender meat pounded thin with a cracker breading, served with a really good chunky applesauce. There's no bun, but it comes with mashed potatoes for which she subbed out a baked, I was actually sorry I'd gone for the burger and not the special. I believe its only offered on Wednesdays, but I plan to return and make sure this wasn't a fluke. If you work this just right, you may start a bidding war for your return rides home. Reading your description of the pork sandwich, I'm ready to start the bidding. Do we get to hear your talk? I made it back to Breitbach's and this time I remembered the BPT was where it's at. Located about 16 miles up the river from Dubuque they won the Iowa Pork Producers Association 'Best Tenderloin' award at the State Fair in 2012. 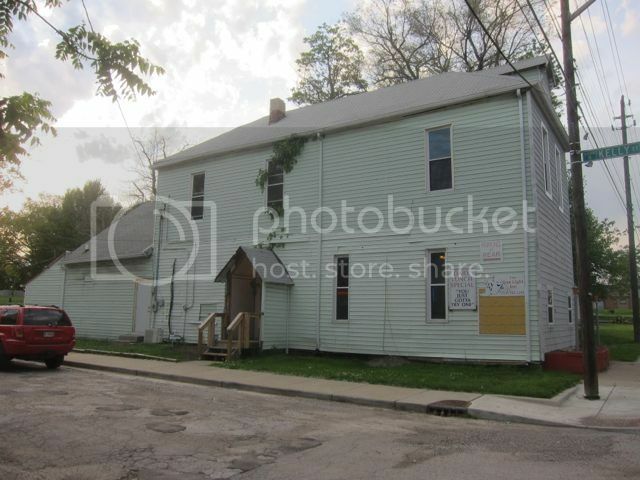 It also happens to be Iowa's oldest bar/restaurant having been in operation since 1852. Though two fires since 2007 have forced them to rebuild, the country charm remains. Currently running on its fourth generation of family member they put out about 250 BPT's a week. I didn't snap an outside pic so the one up above was from my last stop in. It was surprisingly quiet on this Sunday around high noon. Pretty damn windy thus not too many bikers out and those of whom were there seemed to be doing family stuff with almost everyone indulging in their famous Sunday buffet. No tenderloins available with that though so we took a seat at the bar. The 'tender might of been a little hungover as he was kind of a jag but I wasn't there to see him. After about a ten minute wait my tenderloin was ready. This one was pretty appealing on the eyes and pretty much as good as it looks. I thought it might of been a tad too greasy but this could be due to the fryers having just been ready. Nonetheless a BPT with some substance as there was some juicy meat inside the extra light but sensationally crunchy batter. One of the better ones I've consumed. I'm not one to go out of my way looking for a BPT, but Da Beef, that photo of yours of Breitbach's battered pork tenderloin is probably the best one I've seen. I pessimistically expect BPTs to be tough and dry (and when I encounter one that lives down to my expectations, I think of it as the DPT --- dreaded pork tenderloin), but that batter looks great and its believable that the pork underneath is juicy. If you'd said that was battered and fried chicken or fish, I'd have believed you. Bookmarked under Iowa. Brietbachs tenderloin is fantastic - I got 1/3 of a sandwich and savored the perfectly cooked and battered tenderloin without bread or toppings. 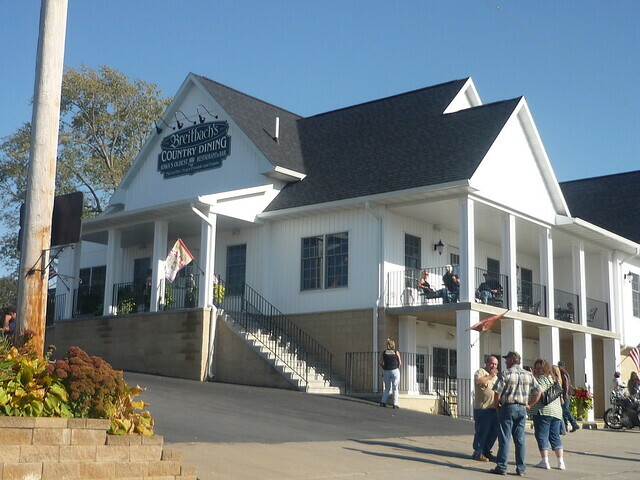 Brietbachs and Kitty's Cafe in K.C. are probably # 1 and 1a in my book for tenderloins. 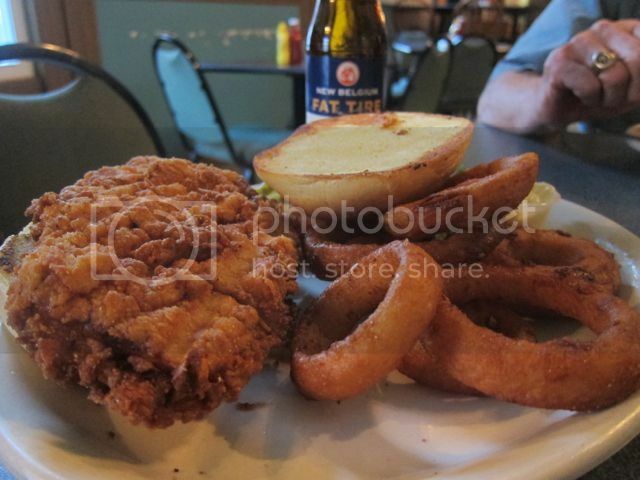 That's interesting about Breitbach's tenderloin because I had one last March and it definitely had breading in it. I tried another of Quincy's tenderloin sandwiches while in town for the holiday. Kelly's Tavern is more well known for their salad bar--or more precisely, for the cheese soup and super-gooey cinnamon rolls available on that "salad" bar--than for the rest of their menu, but I'd had their tenderloin sandwich recommended to me so I checked it out. According to their menu, it can be ordered "grilled or battered" but not breaded. I got the battered version, expecting something akin to the tempura tenderloin Titus posted earlier this year. But the battering was more of a fried chicken style where the meat is dredged, then soaked, then dredged again. I guess since there are no bread crumbs that counts as battering? I don't know. I do know the flour could have been better seasoned, especially since the tenderloin was not pounded out flat at all, but presented as a 1" thick chunk of pork. It was not bad at all, but not what I expect when I ask for a tenderloin. Kudos to Titus for his article in Serious Eats re: Top Ten BPT in the Midwest!! Well done, Titus! I don't know how to post pictures from my I phone library. Any help? If your ever near Canton or Farmington IL. in between the two is a quite little Village of Norris that serves up handfuls of Awesomeness Choices. Amongst all that is the Sandwich that put us on the Map 33yrs ago in August. 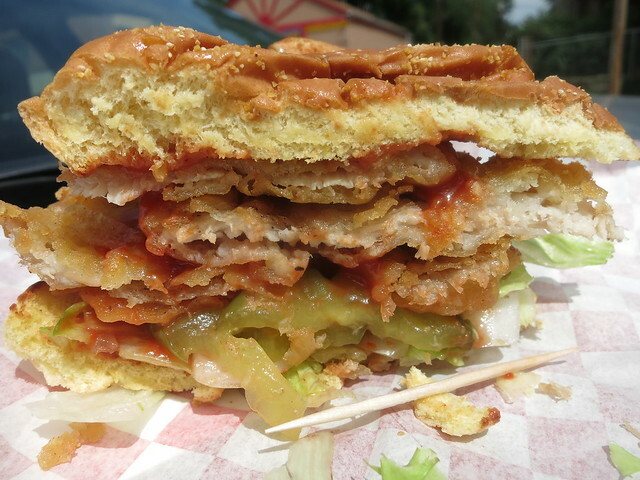 Shirley's Giant Pork Tenderloin.A 1pound Pork Tenderloin tenderized, hand breaded, rolled, and fried golden brown. This is just as much a post-it note to me, though maybe someone may get there first. Anyone have a recommendation for a good BPT sandwich in the South Bend area or on the way between Chicago and South Bend?